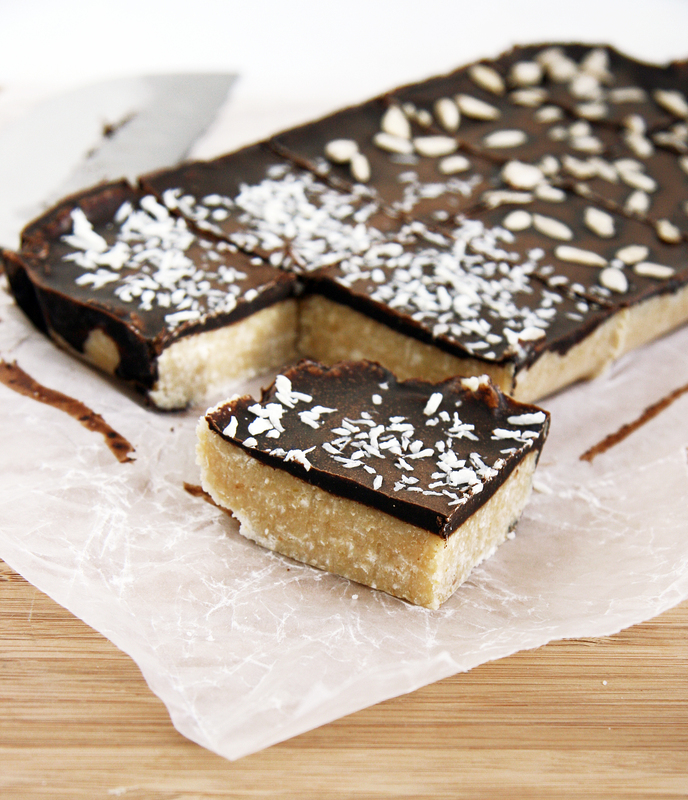 A few weeks ago, Sonia at the Healthy Foodie posted a recipe for her peanut butter and chocolate energy squares. These little squares looked and sounded so appealing, I had them on my mind until I was able to get into the kitchen and whip a version up myself! Though I love peanut butter and chocolate together, I opted for a caffeine free and nut free version, just for kicks 🙂 I admit, these bars are quite addicting and were the perfect pre and/or post workout snack when I was needed something quick. They taste SO, SO yummy that these squares were enjoyed for dessert on several nights as well. Next time (umm, this week), I will triple the batch because I went through these so fast! If you wanted to increase the protein content by several grams, substitute half of the coconut butter for almond or peanut butter and use almond meal/flour for the coconut flour if preferred. If you want a lower calorie bar, cut them smaller into 10 or 12 servings – it’s up to you! 1. Line a loaf pan with parchment paper or wax paper and set aside. 2. In the bowl of a food processor, combine coconut butter, applesauce, sweetener and extracts. Process until smooth. 3. Add in protein powder through sea salt and pulse until combined and well incorporated. If the mixture looks too wet, add a bit more flour (the bottom layer will firm up when refrigerated though). Spoon and spread into the loaf pan and refrigerate until firm (I left the bars overnight, but you also freeze the bars for an hour or so before finishing them with top layer). 1. Combine all of the topping ingredients and stir with a spoon or fork until well combined. Pour/spread over the chilled bottom layer and sprinkle with chopped nuts/seeds/coconut. 2. Place bars back in the refrigerator or freezer until firm (several hours). Cut into bars and enjoy! I stored these bars in the freezer (these tasted fantastic cold) but refrigerated works well too. Mmm I love that you chose to make them nut free! Many of these sorts of bars have nuts, so it’s good to see something different! Oh my, these look DEEEEE lishus. 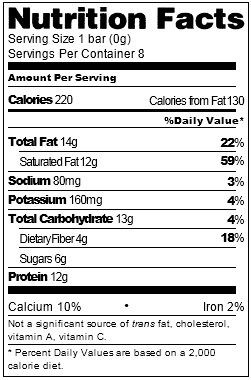 What do you use to make those perfect little nutrition labels? These look sooo good! Probably one of the best energy/protein bars/squares I’ve seen in awhile! Wow, Nora, your version looks totally amazing! They look like chewy, yummy, decadent fudge, coated with chocolate… and I am a total fudge fanatic. Oh god, I want a bite now… especially since I’m starving. It’s way past breakfast time for me. Got to go take care of that tummy before it goes crazy on me. Could you please send me a few of these? That sure would calm him down. Thank you so much for creating something so decadent looking based on one of my recipes. Glad I could inspire THAT! Now I think I’ll have to try your recipe out. YUM!!! Fudge bars – that’s about right! Well I have you to thank for the inspiration Sonia! I wish we lived closer, I would 100% bring you over some if I could! 🙂 These went quickly, too quickly I must say so, I’ve made them again in a larger batch and have been eating them for breakfast (I’m on a sweet breakfast kick these days). I just had to giggle – your comment about “little power warriors” is an awesome description – I may have to use this name for my next batch and give your props! These look and sound amazing! I love your take on them in coconut form. I don’t think I’ve ever seen coconut flour though – where did you find yours? 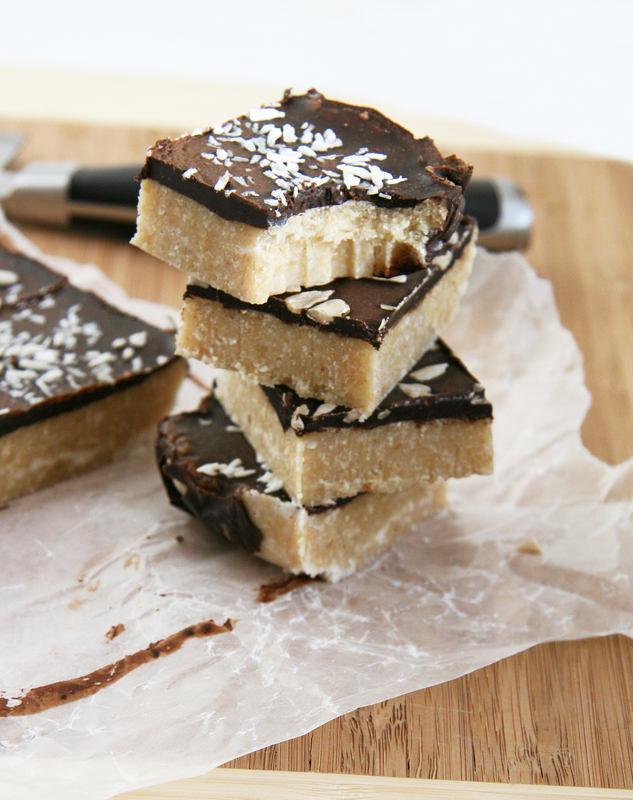 i love coconut and i love chocolate… these are perfect! Thanks Katie 🙂 I love coconut and chocolate too — yummmmm! Oooh, these look delicious! I love the look of the texture and imagine they would be dangerously good out of the freezer, which is where I usually hide treats I don’t want to eat 🙂 Great recipe! Any ideas what would be a good substitute for protein powder? We have MSG allergy. I bet you could use non-fat milk powder – or does that contain MSG as well? I can’t wait to try these… they look great! These look fantastic. I have been looking for a new protein bar recipe and this is so unique! Did you come up with the recipe yourself? Thanks so much! Yes, I sure did 🙂 I love experimenting in the kitchen, so fun! I sure did 🙂 I love playing with recipes, I started throwing ingredients into my food processor and tasted along the way! What did they look like? Glad you liked the taste though! No coconut butter here….should I sub regular butter…or coconut oil? Coconut oil and butter have a different consistency and taste…you can use a nut or seed butter instead though! Do you know a good substitute for oat flour and oat bran? I can’t eat oats and really want to make these! HOLY COW! SO good! 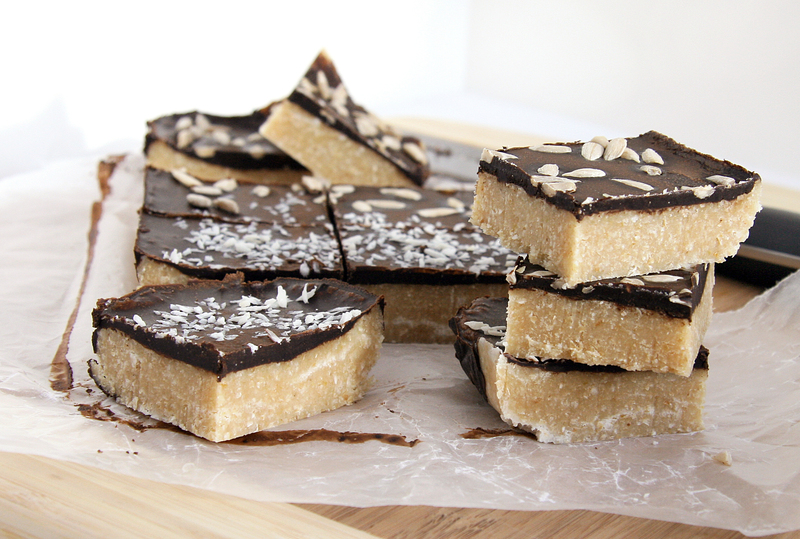 I just made these for a Friday night post workout treat! Definitely going to make these again and again and again! I used Almond Meal in place of Oat Flour since I didn’t have any on hand. Thank you for the recipe! 🙂 Thanks so much for your feedback, and I am so happy to hear you enjoyed these! Thank you so much for a gluten-free, nut-free recipe that sounds really delicious. I can’t wait to try it!